With promotion rivals Barnsley and Yarnbury both suffering surprise defeats, it was very timely for Old Crossleyans to produce one of their most impressive displays for many a season yesterday. They were 79-7 home winners over a Wetherby side that they only defeated with a score in the final minute of the reverse encounter back in November. The only blemish was a late red card shown to a Crossleyan player for an alleged high tackle, a decision that stunned the home crowd and the coaching staff of both sides. In the absence of Callum Dunne at fullback, schoolboy Charlie Nendrick made his debut and produced a confident display. Fellow youngsters George Ackroyd and Joe Stott also caught the eye, the former scorching in for a hat-trick of tries and Stott being man of the match for a polished and energetic performance at scrum half. Freddie Walker, a constant threat to the visitors, and Iain Davies, who gave his most impressive display so far, also registered hat-tricks. The pattern was set directly from the kick off, when Wetherby stand-off Harry Kaye failed in two attempts to kick the ball the required 10 metres. From the resulting scrum the home side surged up field only for Ackroyd to be denied the opening score by a forward pass. However, the outstanding Martin Hamer and Ollie Coyne, playing at prop in the absence of Andy Day, both made strong drives and slick passing along the backs allowed winger Walker to run in the opening score. Joe Gallagher, who directed operations well from fly half, converted and added another from wide out when Ackroyd had breezed in from 50 metres. George Hammond replaced Raman Sembi (shoulder) but the scores kept coming for the rampant home side. Cameron Brannan provided Ackroyd with a pass for his second try and Rob Oliver took advantage of a poor clearance kick and scored near the posts. Neil Richardson, stepping in at centre for the first time since the opening weeks of the season, made a strong break, Stott put in a grubber to the corner and Walker pounced for his second. Just before half time Davies benefited from another Brannan run, Stott was in support and the flanker powered over. There was still time before the break for Davies to force his way over again from a tapped penalty. 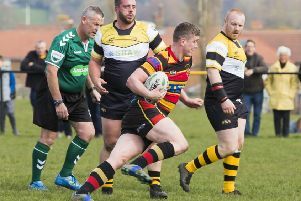 Player-coach Ryan Hammond and skipper Jack Hammond, both to the fore, were determined not to let their charges ease off despite a 45-0 lead. Brannan soon charged down a kick to score and Gallagher’s towering clearance led to further pressure before replacement James Cooper sent Walker in for his third. Ackroyd, on the other wing, soon followed him over the line and a trademark storming run from Phil Schedlbauer was followed by Stott throwing a dummy and sauntering in under the posts. Wetherby never gave up and flanker George Gilbert caught the eye with a couple of good runs. The visitors finally powered across the try line from a five yard scrum. The Crocs response was immediate, Davies’s determination ensuring his third score. Good cover from Oliver prevented another Wetherby try before the visitors’ miserable afternoon was completed by skipper Jack Hammond’s 60 metre interception try. Old Crossleyans are in action again on Wednesday (6.30) against Old Grovians at Keighley RUFC on the 4G pitch under floodlights. The rearranged match was scheduled for next Saturday but Grovians can’t raise a team on that day.